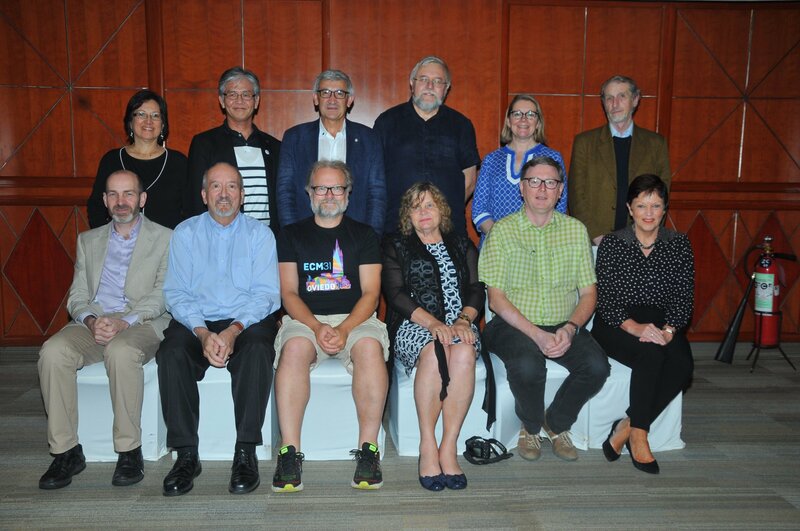 Front row: Alex Ashcroft (IUCr Executive Secretary), Marvin Hackert, Sven Lidin, Hanna Dabkowska, Luc Van Meervelt, Jane Robinson (Administrative Assistant to the Executive Secretary). Back row: Graciela Diaz de Delgado, Masaki Takata, Santiago Garcia-Granda, Radomír Kuzel, Jennifer Martin, Wulf Depmeier. 2013: Acta Cryst. (2015). A71, 114-140. 2012: Acta Cryst. (2014). A70, 385-415. 2011: Acta Cryst. (2013). A68, 210-239. 2010: Acta Cryst. (2012). A68, 401-429. 2009: Acta Cryst. (2011). A67, 96-124. 2008: Acta Cryst. (2010). A66, 98-126. 2007: Acta Cryst. (2009). A65, 52-75. 2006: Acta Cryst. (2007). A63, 484-508. 2005: Acta Cryst. (2007). A63, 204-228. 2004: Acta Cryst. (2005). A61, 586-620. 2003: Acta Cryst. (2005). A61, 265-299. 2002: Acta Cryst. (2003). A59, 588-622. 2001: Acta Cryst. (2003). A59, 66-102. 2000: Acta Cryst. (2001). A58, 80-116. 1999: Acta Cryst. (2000). A56, 609-642. 1998: Acta Cryst. (2000). A56, 193-225. 1997: Acta Cryst. (1999). A55, 585-600. 1996: Acta Cryst. (1997). A53, 814-852. 1995: Acta Cryst. (1996). A52, 958-999. 1994: Acta Cryst. (1996). A52, 91-124. 1993: Acta Cryst. (1995). A51, 204-233. 1992: Acta Cryst. (1994). A50, 127-156. 1991: Acta Cryst. (1992). A48, 922-946. 1990: Acta Cryst. (1991). A47, 606-630. 1989: Acta Cryst. (1990). A46, 871-896. 1988: Acta Cryst. (1989). A45, 739-764. 1987: Acta Cryst. (1988). A44, 741-764. 1986: Acta Cryst. (1988). A44, 81-103. 1985: Acta Cryst. (1987). A43, 137-155. 1984: Acta Cryst. (1986). A42, 58-79. 1983: Acta Cryst. (1985). A41, 91-109. 1982: Acta Cryst. (1984). A40, 68-85. 1981: Acta Cryst. (1983). A39, 481-499. 1980: Acta Cryst. (1981). A37, 922-941. 1979: Acta Cryst. (1980). A36, 1072-1088. 1978: Acta Cryst. (1979). A35, 1068-1083. 1977: Acta Cryst. (1978). A34, 1031-1046. 1976: Acta Cryst. (1977). A33, 1028-1042. 1975: Acta Cryst. (1976). A32, 1019-1033. 1974: Acta Cryst. (1975). A31, 860-875. 1973: Acta Cryst. (1974). A30, 857-870. 1972: Acta Cryst. (1974). A30, 109-123. 1971: Acta Cryst. (1972). A28, 665-679. 1970: Acta Cryst. (1971). A27, 685-696. 1969: Acta Cryst. (1971). A27, 82-94. 1968: Acta Cryst. (1969). A25, 719-731. 1967: Acta Cryst. (1968). A24, 705-714. 1966: Acta Cryst. (1967). 23, 1115-1129. 1965: Acta Cryst. (1966). 21, 620-628. 1964: Acta Cryst. (1965). 19, 872-878. 1963: Acta Cryst. (1964). 17, 1488-1496. 1962: Acta Cryst. (1963). 16, 708-718. 1961: Acta Cryst. (1962). 15, 728-736. 1960: Acta Cryst. (1961). 14, 797-806. 1959: Acta Cryst. (1960). 13, 565-574. 1958: Acta Cryst. (1959). 12, 615-622. 1957: Acta Cryst. (1958). 11, 567-574. 1956: Acta Cryst. (1957). 10, 391-398. 1955: Acta Cryst. (1956). 9, 691-696. 1954: Acta Cryst. (1955). 8, 857-864. 1953: Acta Cryst. (1954). 7, 868-870. 1952: Acta Cryst. (1953). 6, 878-880. 1951: Acta Cryst. (1952). 5, 550-556. 1950: Acta Cryst. (1951). 4, 566-567. 1949: Acta Cryst. (1950). 3, 388-391. 1948: Acta Cryst. (1949). 2, 195-196.